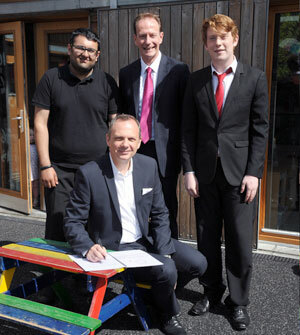 FOLLOWING its recent, internal survey of Scottish nurseries in which 100 per cent of managers agreed that children benefit from strong male role models, Greenock-based Childcare Management Company (CMC) announces it has secured Youth in Partnership World (YIP) as its Premium Partner in a project designed specifically to address the issue. With only two per cent of staff working within the childcare arena currently male, the newly devised ‘Early Learning and Childcare – ‘All About Men’ Programme was launched today ( Friday 23 May 2014) with the aim of encouraging young men initially in the East Ayrshire area to consider Childcare as a career. Working in partnership with Cumnock based YIP World, who have direct access to young males leaving school and may have an interest in careers in the childcare sector, CMC will provide fully funded Modern Apprenticeship training. Commencing their Early Learning and Childcare employment with YIP World, the 5 young men, aged 16-19 year old will then participate in a 12 month SVQ Level 3 in Social Services (Children and Young People). Today’s announcement coincides with Skills Development Scotland’s Scottish Apprenticeship Week (19-23 May). The Week is designed to highlight the benefits to industry in employing Modern Apprentices, by providing businesses with financial support in return for offering work-based training towards an industry approved qualification. Skills Development Scotland supports new starts or existing employees under 25 who need training or professional development to upgrade their skills in over 25 industry sectors.